of 24 x 36: A Movie About Movie Posters. beverage. Visit sloma.org for more information. Name an iconic movie from the past 30 years and odds are Jeffrey Bacon designed the poster for it. Back to the Future. Edward Scissorhands. Gladiator. Home Alone. The Goonies. There's Something About Mary. The list goes on and on for the credits the current Morro Bay resident can claim. About 100 of Bacon's posters are currently on display at the San Luis Obispo Museum of Art as the Jeffrey Bacon: Dreams for Sale exhibit. 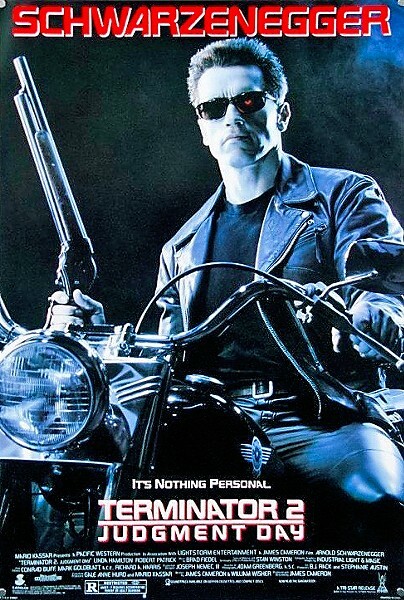 HASTA LA BYE BYE While shooting photos of Arnold Schwarzenegger at a mall for the Terminator 2: Judgment Day poster, Jeffrey Bacon was surprised to see that passersby didn't think it was the actual actor but just a crazed Terminator fan. While his career as an art director and designer spanned three decades, about 20 years ago Bacon was diagnosed with Parkinson's disease, just like his good friend Michael J. Fox. Things got bad. And then after a life-changing surgery, they got better. The average life span after being diagnosed is about 11 years, and Bacon has surpassed that and then some. "To go from, 'I'm not going to make it,' to now ... I've gotten the ultimate reboot," Bacon said. Years ago when Bacon was fresh out of art school, he had two job offers: one from ice cream titan Baskin-Robbins and one from Seinger and Morrison, a design group in the LA area that created posters for big-time movies. Bacon hated Baskin-Robbins' trademark brown and pink colors and he'd always liked going to the movies, so he went with the latter. He was originally given the night shift, but when someone didn't come into work one day, he got pulled onto the day shift to run a photo shoot for the 1980 film 9 to 5, starring Dolly Parton and Jane Fonda. Bacon was visibly nervous and when Parton asked why, he explained that he wanted to do a good job. LIVING FULLY After being diagnosed with Parkinson's disease 20 years ago, Jeffrey Bacon is still designing and teaching. "Well, we just got to teach you proper then," Parton told Bacon. The singer/actress's lessons and that photo shoot went well, so well that Bacon starting getting put on all the big movies that came in. Private Benjamin, starring Goldie Hawn. The Great Muppet Caper. Dream Girls. Bacon developed his own design aesthetic, a diamond composition inspired by the Spanish painter El Greco. He also avoided using green unless it was the main color associated with the film (exceptions were made for Kermit on The Great Muppet Caper as well as on the poster for the hit musical Wicked). "It makes the colors more primary, and it creates an impact," Bacon said. 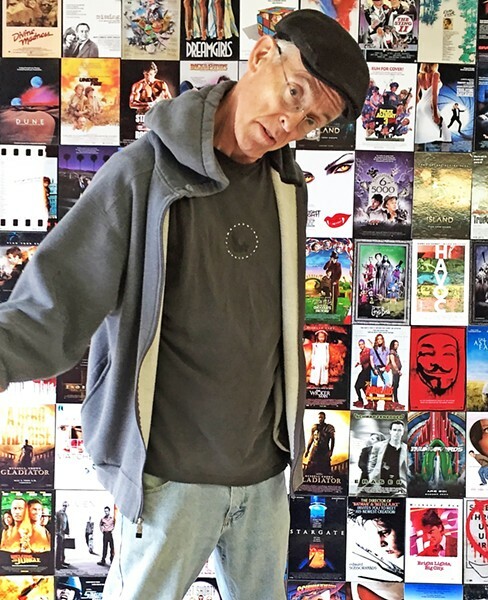 Bacon's favorite films fall under the action or comedy genre, but he doesn't care much for horror, so you won't see many horror film posters that he's designed. His process always started with reading the script (but just the first half, so he wouldn't get too caught up in the plot of the film when designing), rough sketches, and finally tighter designs or photos. While directors like Steven Spielberg or Ridley Scott were always happy with his work, Bacon was in it for the work itself. 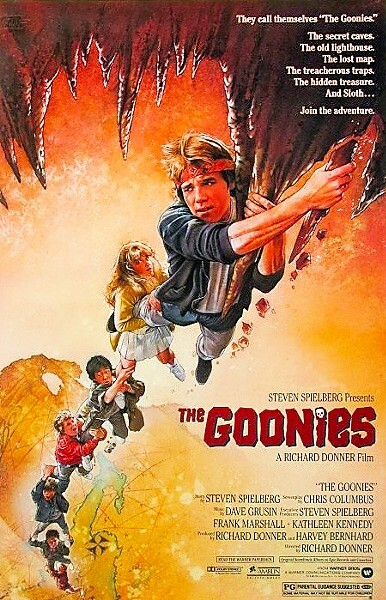 NEVER SAY DIE According to designer and Morro Bay resident Jeffrey Bacon, Steven Spielberg movies like The Goonies were always a blast to work on. "My favorite moment is when the work is over and we don't know what people thought of it yet, but we're proud of it," Bacon said. Today, Bacon still designs and also teaches at Atascadero High School, Cuesta College, and Cal Poly. His show includes a student competition for high school students, with the two winners receiving a tour at Universal Pictures Marketing and a one-week internship at The Refinery, one of Hollywood's top creative advertising groups. It's important to Bacon to help others make it in the art world like he did. Arts Editor Ryah Cooley always puts nutritional yeast on her popcorn at the movies. Contact her at rcooley@newtimesslo.com.